On Wednesday 24th August I had my third caffeine infusion, I had hoped by now to have had my epidural blood patch the only recognised treatment for someone who is severely impacted by a CSF Leak but unfortunately it seems that the hospital in which I am getting treatment are unable to convince their anaesthetists that regardless of the fact I have Ehlers Danlos Syndrome it needs to be performed. So the stop-gap treatment of a caffeine infusion every 4 weeks has become my only treatment for the last 12 weeks, despite the fact I sprang a leak in April this year. When I found out on Monday 22nd April that the epidural blood patch would not be happening anytime soon my world imploded. I can’t fathom why, with all the medical evidence that states people who have a spontaneous cerebrospinal fluid leak are likely to have a connective tissue disorder and that an epidural blood patch is one of the few treatments to “cure” this condition that I am now being referred onto another hospital, The National Ehlers-Danlos Syndrome Unit in Bath. This is with the hope they have seen patients before with EDS and a CSF Leak and that they will a) perform the epidural blood patch b) If they can’t do the epidural blood patch refer me to someone who can. Leaving me feeling like a case of medical pass the parcel. Angry, frustrated, end of my tether didn’t even come close to describing how I was feeling. Although it is great that I am not just being left, this now means more waiting and I have no idea how long with this unit (the only type in the country) being massively oversubscribed. I won’t lie I cried my eyes out with frustration and got slightly (well quite a bit) animated on the phone with the specialist registrar who has been treating me. I know it’s not his fault and he is also disappointed with the turn of events. I was so down about it all I could hardly bring myself to speak afterwards. The only good thing that came from it was that I was also going to receive my occipital nerve blocks at the same time as the infusion, something which they had been hesitant to do previously on the same day. However when you have over an hours travel each way to get to the hospital and your husband is having to take time off work every month so that you can get treatment, I think it’s more than reasonable. Actually the occipital nerve blocks and the infusion wasn’t the only good thing to come from getting the appointment on Wednesday. My good friend Sharon was going to keep me company whilst I was having my infusion etc and I managed to rope her in as the photographer for my blog. I had previously been in contact with my new PoTs / EDS consultant who works in the same hospital and managed to get him to agree to pop in and see me whilst I was being treated. 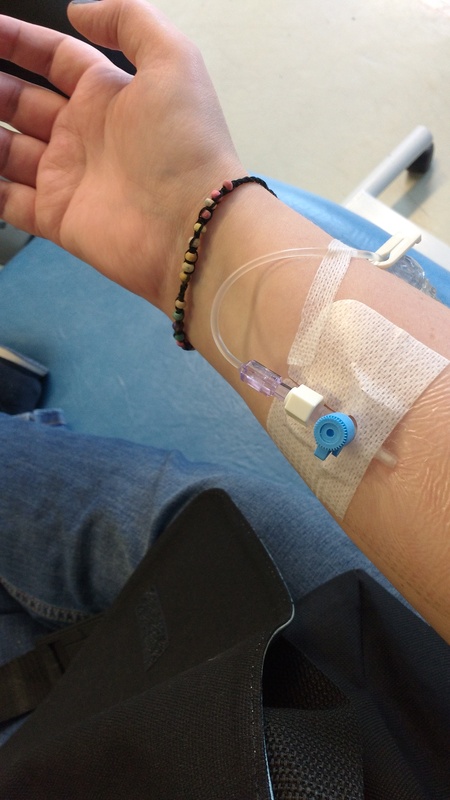 Due to the CSF Leak I have only been able to travel to the hospital when getting a caffeine infusion, so I hadn’t seen him since my first appointment in December 2015, although I had been in contact with him via email. I also wanted my consultant to meet Sharon as for a while now I have believed that she is also suffering from hypermobility / EDS and she also has heart problems which maybe PoTs or Inappropriate sinus tachycardia. I can be a crafty bugger and knew that it would be a productive meeting for both Sharon and myself. As it was my third time at the unit the staff recognised me, I am affectionately known as the caffeine lady. As caffeine infusions happen quite rarely (most people are lucky enough to get an epidural blood patch when their neurologist recommends one) and certainly not on a 4 weekly basis. I am lucky, many people are written off with the diagnosis of NPDH (new, persistent, daily, headaches), which means you have a headache of unknown cause which happens everyday. The only method of treatment for NPDH is painkillers, many people’s lives are changed forever due to the level of pain they are in. Many of those diagnosed with NPDH actually have a spontaneous cerebrospinal fluid leak and struggle for years to get the correct diagnosis. I do thank my lucky stars that for the first time in my life my symptoms are textbook perfect for a change and that I was diagnosed during my first appointment. However diagnosis is one thing acquiring treatment is another challenge. This time rather than resembling a pin cushion the member of staff managed to get a vein first time but unfortunately the site was way too painful for me to sit with the cannula in for two hours. This guy obviously was good as he got the second vein first time. I have bruised but I always do and it is nowhere near as bad as the last time. For some reason with this infusion no ECG was carried out before or after and no heart monitor during. I did think this was strange due to the fact caffeine can mess with your heart rhythm. Even Sharon asked the nurse’s why there was no heart monitor and we were told that I didn’t need it. Funny though that when I saw my PoTs / EDS consultant he made a face when he saw I wasn’t being monitored and the specialist registrar when he came to do my occipital nerve blocks asked the staff to do an ECG when the infusion was finished. However that wasn’t done either. I text messaged my PoTs / EDS consultant as soon as the infusion was set up to let him know I was in the building. He arrived soon after and must have spent a good hour talking to myself and Sharon. He wants me to have a 24 heart monitor put on to see if we can catch my erratic heart rates and he is going to write to my gp regarding prescribing melatonin to see if that helps me sleep as since the CSF Leak developed I either can’t sleep at all or sleep for hours on end but wake feeling like I haven’t slept at all. He is also going to come up with a medication to help relax my muscles that frequently go into spasm as the medication I was on previously caused me to suffer from vertigo. Something I didn’t realise until at his request I stopped taking them. 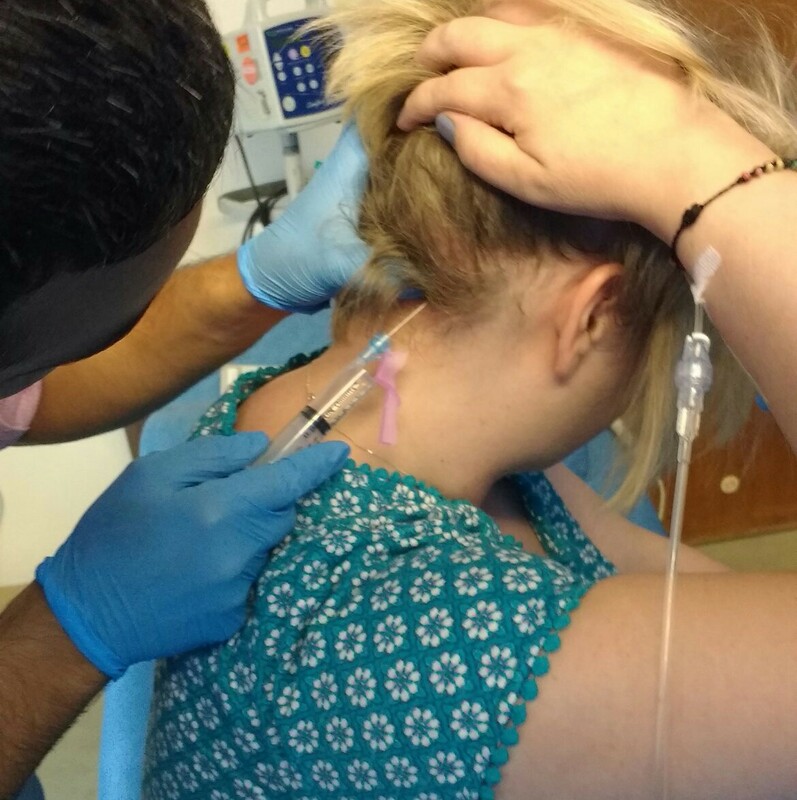 I then had my occipital nerve blocks and I have Sharon to thank for taking the photographs for me. Although I quite honestly say on seeing them I am thankful that I couldn’t see the size of the needle or how deep under my scalp it goes in. Sharon did provide a running commentary and she did say to me afterwards she felt quite faint watching. Thankfully the injections were not as painful as they were the first time, when I said I would never ever have them again and swore quite a lot. This time I managed not to swear and only kicked the table away when the registrar hit the sweet spot. With these injections it is important the doctor injects into the area that hurts the most so that you get the best results. Combined with the caffeine infusion this time I have had a better result which shows my pain is being amplified by the occipital neuralgia which has been triggered by the leak. If you are of a nervous disposition you may want to skip the photos! 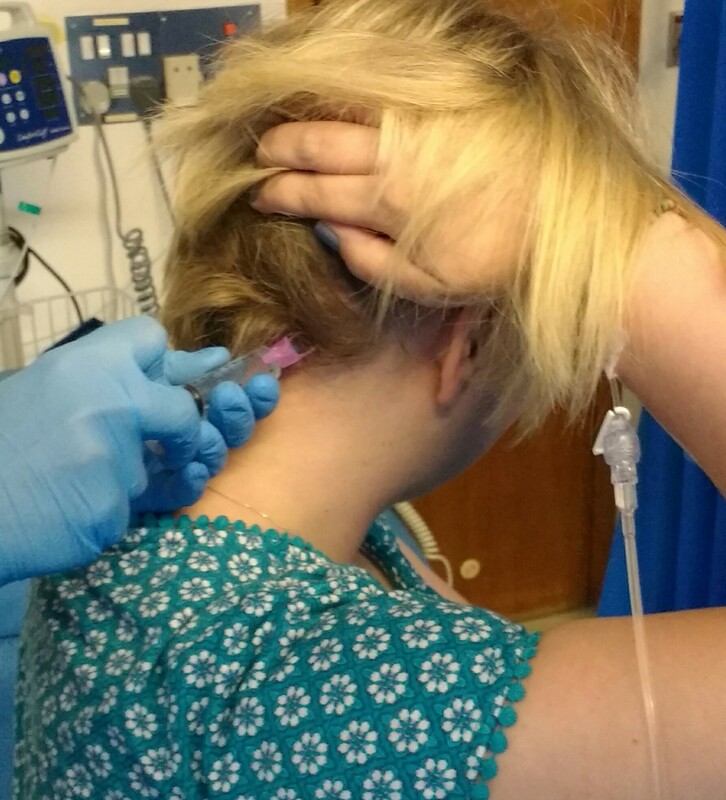 The occipital nerve block injections although painful really do help. I look at it as very short-term pain (4 injections, two each side) for long-term gain. The injections last about 4 weeks and it means I can lie down with the back of my head resting on a pillow, where as once they have worn off just the thought of doing that can make my eyes water. The caffeine infusion has worked and the last one worked better than I appreciated as the headaches came back with a bang and were worse than ever two weeks after the infusion. So at the moment I am in the honeymoon period where instead of my head pain being in the range of 8-9 out of 10, it’s currently a 3-4 out of 10.